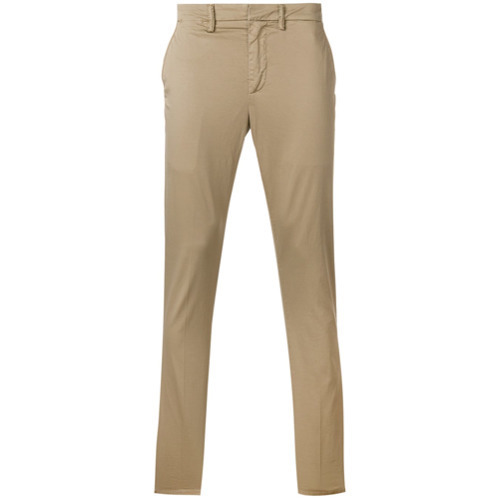 This pairing of a beige shawl cardigan and Dondup slim fit chinos is very easy to make up in next to no time, helping you look amazing and ready for anything without spending too much time digging through your closet. Black leather desert boots work spectacularly well within this look. This combo of a black blazer and Dondup slim fit chinos is so easy to put together without a second thought, helping you look sharp and ready for anything without spending a ton of time combing through your closet. 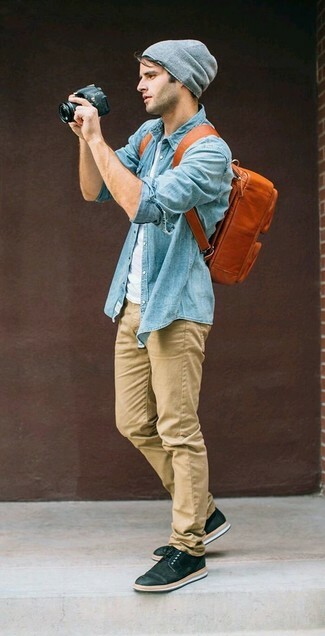 Channel your inner Ryan Gosling and throw in a pair of dark brown leather tassel loafers to class up your look. If you're looking for a casual yet on-trend outfit, consider pairing a light blue chambray long sleeve shirt with Dondup slim fit chinos. Both items are totally comfortable and will look great paired together. Why not add black low top sneakers to the equation for a more relaxed feel? 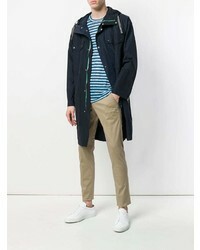 If you're searching for a casual yet dapper outfit, pair a navy zip sweater with Dondup slim fit chinos from farfetch.com. Both pieces are totally comfortable and will look great paired together. Sporting a pair of brown leather chelsea boots is a simple way to add some flair to your outfit. 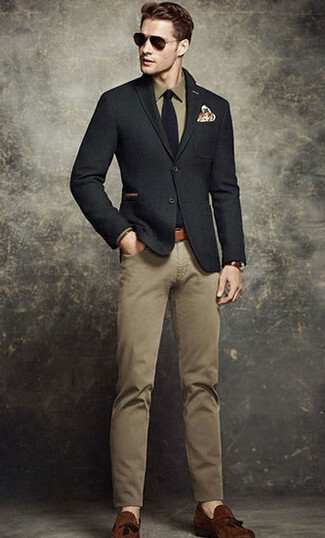 For a casually elegant look, make a black wool blazer and Dondup slim fit chinos from farfetch.com your outfit choice — these two pieces go beautifully together. Up the cool of your look by rounding it off with brown suede tassel loafers. 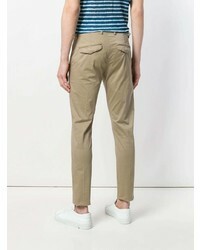 If you're in search of a casual yet seriously stylish ensemble, rock a charcoal chambray short sleeve shirt with Dondup slim fit chinos from farfetch.com. Both items are totally comfortable and will look great together. You could perhaps get a little creative when it comes to footwear and dress up your ensemble with tan suede derby shoes. 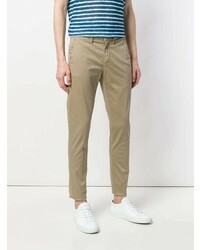 If you're on a mission for a casual yet on-trend look, consider pairing a white v-neck t-shirt with Dondup slim fit chinos. Both garments are totally comfortable and will look great together. Balance this look with navy canvas espadrilles. The mix-and-match capabilities of an olive bomber jacket and Dondup Slim Fit Chinos guarantee they will be on permanent rotation. If you need to instantly dress down your ensemble with a pair of shoes, why not enter white leather low top sneakers into the equation? 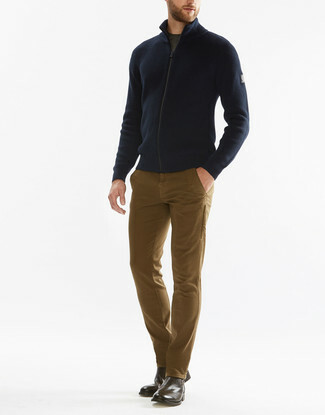 If you're on the lookout for a casual yet stylish getup, consider wearing a navy v-neck sweater and Dondup slim fit chinos. Both items are totally comfortable and will look great together.